Championship football makes a return to Palmerston on Saturday when we have our first home game of the league season against Dundee United. The games between the two sides we close and entertaining last campaign, hopefully they'll be the same again this year with positive results in our favour. 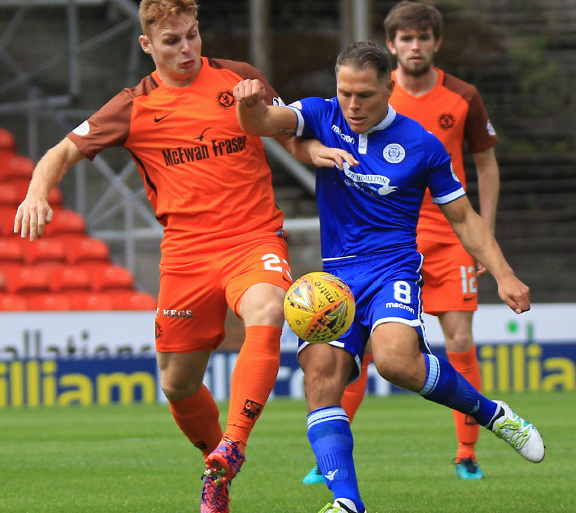 Saturday will offer the home supporters who didn't make it along to the Betfred Group matches a chance to see our squad, including new signings, Gary Harkins, Michael Doyle and Callum Semple. While we have added a few new faces, it will be an all change United side with manager, Csaba Laszlo making sweeping changes during the summer. Our boss, Gary Naysmith has been looking ahead to the fixture. "There's always a feeling of excitement before the first home league match of the season and this is a game I've been really looking forward to. I have been pleased with our form so far but I know there is still more to come from us. I am really pleased that we have qualified from our Betfred Cup group and the visit of St Johnstone here in a fortnight is another game to relish. But we'll take that one when it comes and all our focus this week has been on Dundee United. I was delighted with the character that the lads showed last weekend at Greenock Morton. You have to say that it was a good point for us when you consider that we were two goals behind with just over a quarter of the game to go however we stuck at it and in the end, we could even have won. Callum Semple marked his debut with a goal and that's something I want him to bring to the team. As for this one, Dundee United will want to bounce back from last week's home defeat to Dunfermline. It was a result that will have taken many observers by surprise but it just underlines once again the competitive nature of this division. I firmly believe that all the teams in the Championship have the capability to beat any of the others. It's going to be a very tight division again and that's why it's never too early to get points on the board and get some really positive momentum. I said after the game at Cappielow that I really feel there is a togetherness within the Club this season and that's going to be important. We had great support at Morton last week and I look forward to more great positive backing at Palmerston. Everyone is fit, available and ready to go". There are a range of tickets prices available for the game, adult tickets are £18 with concessions £10 and under 16's a fiver. Of course, season tickets come into play, and with it the cheapest way to watch Queens this season, you still have time to purchase your season book prior to kick off. Junior Blues tickets are only £18 per child which works out at a pound a game. The popular Saturday Club is also returning for a new season. Saturday Club is for Primary School aged children and runs from 1230 before all home Saturday games. It costs £10 per child (£8 for Junior Blues) and they will receive coaching on one of the Arena pitches, followed by lunch and then they watch the match together as a group in the BDS Digital Stand. Parents can then collect their child after the match. There is no need to pre-book just come along to the Arena before 1230 on Saturday and register at the table beside the pitches. Kick off at Palmerston 3pm.